This is a once-read copy, which I purchased from the bargain bin (has a black magic marker dot on the bottom.) Entry is easy: leave a comment on this post (make sure to give your email when asked, but not necessary in the post). If you want a second entry, sign up to follow the blog or indicate you’re already a follower. For a third chance, repost this giveaway on your Facebook, blog, Twitter, website, etc. and post the link in your comment. Don’t worry if your comment doesn’t appear immediately, because I moderate comments and don’t spend my life at my computer. I’ll randomly select a winner and announce it on Wednesday, June 22. At the end of the month I’ll enter everyone who didn’t win in all my June giveaways into a bonus drawing for a mystery book. Good luck! Congratulations! I’ll be in touch by email. I hope the historical novel society conference proves useful. I considered going myself. 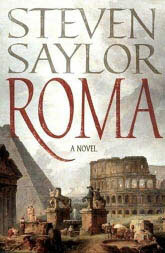 For some reason I haven’t read this Saylor, so I’d love to win it. Thanks! I am sure that I would enjoy Steven Baylor’s book! I follow your blog via my Google Reader Page! And Raffle King has declared the winner…Judith Starkston! I’ll send you an email with the details. Thanks everyone!